Now, THIS is what I’m talking about. No werewolves. No vampires. No British isles fairytale constructs. No Arthurian legends, creaky with age, being unfolded and poorly cleansed of the dust of ages for the nth, nth, nth time. No. This is neither the U.S. nor the UK, but Trenčín, Slovenia, baby. And it’s got big, sharp teeth. Or, you know, big, drown-y-and-then-throws-you-in-a-teacup hands. Whatev. Point: it’s vicious and dark and dangerous…and completely amicable, in a “just doing my job” kind of way. It’s also full of The Crazy, and funny. This is a Tu-worthy book, indeed – another hit out of the ballpark for Lee & Low’s amazing little imprint that could. 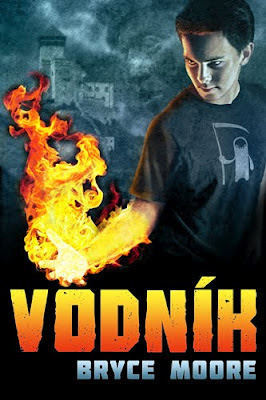 Reader Gut Reaction: The folklore mythologies presented in Vodník are fresh and brand new (well, to most Westerners in the Americas), the character development is realistic and steady, the pacing is a tiny bit erratic, due to the onslaught of details, but it’s fairly consistent. The balance between funny and serious is well done, and the voice is wry and self-deprecating and endearing. While that sounds fairly serious, that’s not the first thing that strikes you over the head about this novel. Here – read the first four chapters and see what I mean. Concerning Character: Tomas – toe-MAHS – is a generally friendless movie buff, and as long as he can put a DVD or a screen between himself and reality, he’s all right. When he wakes in the hospital suffering from smoke inhalation – because the house has burned to the ground around him – he’s a little more than freaked. Eleven years ago, when he was five. Only, that time he came away with his right arm and chest disfigured with third-degree burn scars that reminds him of melted candle wax. He’s been deeply self-conscious about short sleeves and bare skin ever since — and terrified of fire. Oddly enough, the day he was burned? He also, somehow… almost drowned. He’s left with scarring on his lungs — and a pathological fear of water. There’s a lot about the incident Tomas doesn’t remember — make that everything — and, frankly, that’s fine. If it’s not on a movie screen, there are some things Tomas is pretty okay with putting out of his mind. Memories and family mysteries are resurfacing, tied to the “imagination” Tomas was said to have as a small child, where he saw škriatokov and vily – dwarves and fairies – around every corner. While childhood memories are all very amusing, Tomas is finally figuring out the worst bit – it’s not his imagination. The woman in the fire dress… isn’t all in his head. A vodník IS trying to kill him – for real – and make him live out eternity in his teacup. And bargain though he might, Death – not at all the mythological being he imagined – is coming for someone in his family. Some things sound funnier when they’re not happening to you. Recommended for Fans Of…: If you have a taste for a bit of dark humor in your fantasy, this will work for you. Fans of Vampire High by Douglas Rees or The Chronicles of Vladmir Tod by Heather Brewer, or Holly Black’s original Tithe series will enjoy. Themes & Things: At its heart, this novel is partially about memory – and communication – two things lacking, for various reasons, in this family, and often between adults and teens as a whole. Parents might have a “revisionist history” take on one’s childhood, and be happier leaving things in the past which happened – but because Tomas and his family have so long been leery of digging into their past, some memories have been lost – memories and family lore and beliefs which might have kept them safe. In order to get to the truth, a lot has to be disturbed – but like tearing the bandage off of a wound to let it heal, in the end, it’s worth it. Cover Chatter: The chapter illustrations are lovely grayscale little death’s head images which show up on the cover on Tomas’ t-shirt. Death the character is kind of freaky, but the little image is from a helpful book and makes me want that t-shirt. There are a LOT more images, though – Lee & Low have fully appreciated my love for Teh Cover Chat. They blogged the entire process – the images their artist drew, and the whole process of selection for their final image. I LOVE the one which reminds me of a WICKED poster, and the Death on Duty as lifeguard is very near perfect – but I appreciate much the design team’s assessments that they needed to reflect some Roma ethnicity into the cover. The final model is very nearly perfect, and reminds me of my friend Axel, who is Romanian – and gets a lot of the same static about being olive-skinned and Eastern European as Roma do. Authorial Asides: From the notes at the end of the book, you’ll be pleased to find that author Bryce Moore has actually visited Trenčín, really likes the castle, and thinks you’d like it, too. Even if you don’t see a vodník down the well. You can find VODNÍK by Bryce Moore at an independent bookstore near you!